The Paul Barriére Trophy, the prestigious Rugby League World Cup (RLWC) trophy left PNG today (ED: Sunday April 30th) after a very short historical visit – courtesy of Oil Search Limited’s PNG trophy tour. During this short visit, many people from all walks of life – school kids, villagers, sports people, and general members of the public had an opportunity to see it. It was great to see many former Kumul greats from the villages of Hanuabada and Porebada, also join the occasion, joining former Kumul and PNG Rugby league legend Marcus Bai. 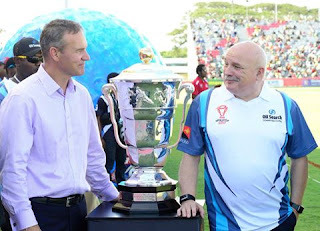 The trophy arrived on Thursday afternoon and visited the Oil Search head office in Port Moresby, accompanied by RLWC officials and Oil Search Trophy Tour ambassador, Marcus Bai. It than paid a visit top to NCD City Hall. The following day it continued the visit to the Motuan villages of Porebada and Hanuabada. Former PNG Kumul players joined in the festivities. Boreboa Primary school was the only school that was included in the short tour and made the most showing true PNG spirit embracing and welcoming the Paul Barrière Trophy with a guard honour from the school gates up to the assembly area. The Fan Zone at the vision city amphitheatre provided more opportunity for the public, as people cued to get images with the trophy whilst a school rugby clinic was conducted by PNGNRL officials teaching children of basic rugby drills. The trophy was taken around the grounds at the National Football Stadium at half time, for members of the public to see, and many used the opportunity to take pics of the trophy. Whilst the tour of the original trophy was short, Oil Search will be conducting a national wide tour of the replica of the trophy in September and October, ahead of the first game when the PNG LNG Kumuls take on the Wales. The tour follows the very successful Oil Search Pacific Games relay in 2015 for the Pacific Games.